I’m not a usually a fan of biochemistry, but in trying to come up with something in biology that fills me with awe I can’t get away from the metabolic pathways that I learned about in my first couple of years at university. When people use the word ‘awe’ in science they’re typically thinking of things that are very complex, intricate, precise, ordered, powerful in some way, and perhaps also beautiful. The discovery of systems that display these traits can be completely unexpected, as when Werner Heisenberg discovered the organisation of energy levels in the atom. Heisenberg was shocked by his discovery of order in the atom, which completely transformed our understanding of the periodic table. I think metabolism is equally important, if a little messier and less beautiful. 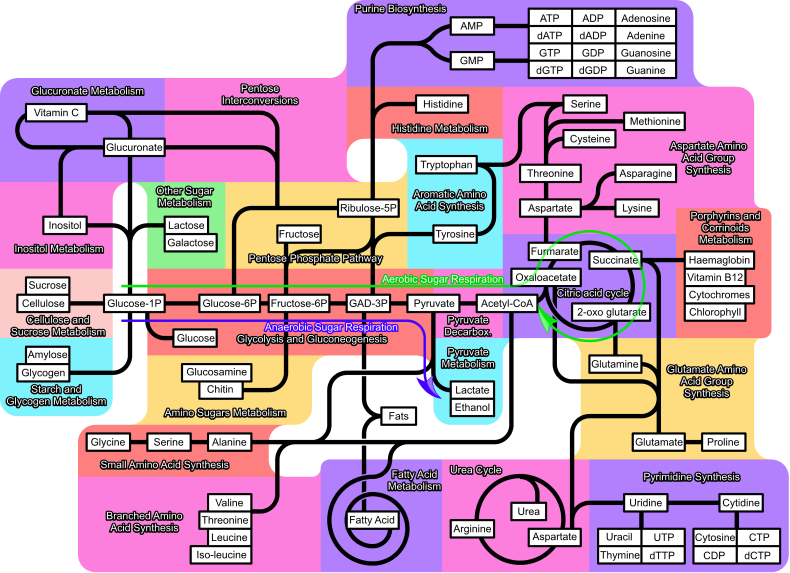 What fills me with awe when it comes to metabolic pathways like the Krebs cycle is the intricacy of the process. There is incredible sub-microscopic detail here: a chain reaction of molecules that would look very uninteresting in a test tube but are vital for keeping us alive. The cycle is robust: these reactions will continue to happen inside our bodies whether we look after them or not. And on a global scale it is incredibly powerful. The Krebs cycle was happening long before words of any kind – let alone ‘Krebs’ – were articulated by human beings, and it occurs in every aerobic (oxygen-using) organism on the planet. Our best efforts to replicate this system would result in a clumsy copy that lacked the compactness and precision of the original pathway in a living organism. I don’t expect everyone to share my feelings about metabolism, but if you look at stars, weather systems or microscopic creatures, and find out more about them you might be filled with a similar sense of stunned wonder. I think most scientists, at some point in their lives, will feel this emotional reaction in response to what they see in their work. There’s a rational dimension to it as well: deep understanding of the way the world works results in deep awe. These are the high points of a scientist’s career, and a reward for the daily grind of life in the lab. This sort of awe stops you in your tracks and you need a few minutes to take it all in. You feel surprise, admiration, delight – maybe even reverence, respect or fear. The moment takes you over and makes you focus. It is a significant encounter that you will probably remember for some time, if not the rest of your life – like my first encounter with a Zebrafish larva. You want to share the experience so you call others over to look, or spend time explaining what happened. You might even become a bit boring as you tell and retell the story… Most importantly, awe can make you think about a whole range of things: scientific, aesthetic, philosophical, perhaps even spiritual. I have invited number of colleagues to share their comments and experiences on awe. Feel free to add yours! * And I think I know why this particular pathway was named after only one of the discoverers… A Bancewicz cycle is also unlikely – the fact that I have left lab science won’t help either. Arguably, the best bit about working in a lab is the ‘a-ha’ moment. When you finally figure something out. That moment of clarity is so exciting for me. I usually dance around the lab. I too love, cycles, and have chosen to study circadian rhythms. There’s something very beautiful about an oscillating rhythm, rather than a flat constant expression. I think it’s important to keep a “child-like wonder” as a scientist, and to keep asking the “why” questions. Keep up the good work Ruth! Wonderful post. As a non-scientist with some scientific knowledge I can really appreciate this. What I cannot really understand is how/what leads some scientists to look at all of this (and more) and say “this is all random, pointless, meaningless, happenstance – it just happens”…. …..random?! (yep, another scientist here)…. I agree, can’t believe that any “A-Ha” moment is completely random. I like my Awe surrounded by a fair amount of logic, even if we don’t understand what we are seeing at the time (maybe that’s why it is so fascinating). Over time (hopefully) others will add more meaning….but yes, I shared the Awe with many a cleaner at 2am…. it is such a beautiful and rare thing when it all works! Thanks Anne. Oh, to be a cleaner in your department! Great post indeed and I will comment on the feeling soon. However, I must say that I went to the zebrafish embryo movie jjust because I thought it would be nice to see it… the **** thing moved me to tears!!!!! Now that’s “awe” right there. Thank you. I am VERY selective with what I reblog on “Baldscientist”; I think you will enjoy this. You must check out the zebrafish embryo link, you won’t be dissapointed! Awe for me was talking to a colleague yesterday about spider silk and to experience her talking so pasionately about her research on genetics. So many spiders and so many adaptations – semi-permeable selective membrane silk, sticky silk, stretchy silk, silk with wound-healing properties that no one understands, and the webs look amazing after a shower of rain too. I work in an area of chemistry where we try and understand and control the way molecules interact with each other (supramolecular chemistry). I spent much of my PhD trying to design molecules which would stack on top of each other to form long fibres and my current work brings molecules together to form discrete geometric objects like cubes and pentagons. If you compare the control over molecules that we can exert as chemists with that shown by the simplest enzymes, let alone in metabolic pathway like photosynthesis or considering a whole cell, you can’t help but be humbled. We may all just be a bag of chemicals but for me that doesn’t make us any less remarkable or God any less awe inspiring. Charles Kingsley summed it up perfectly in a letter to Darwin: ‘We knew of old that God was so wise that He could make all things; but behold, He is so much wiser than even that, that He can make all things make themselves’. Yes, and it’s worth reading! Thanks Jona.